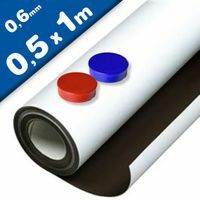 Magnetic receiptive surface - Perfect Holding! 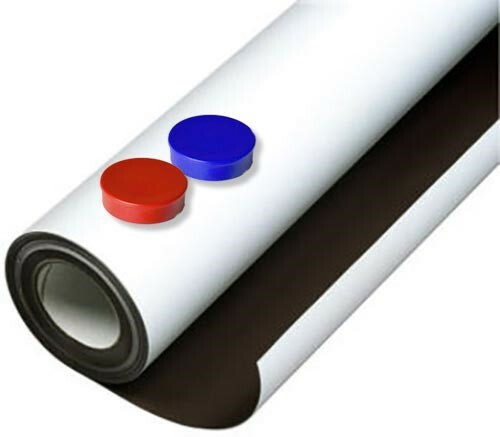 Adhesive Ferrous sheets and tapes are not magnets; instead they provided a surface that magnets stick to very well. White Ferro sheet (magnet receptive material) with a release paper covered acrylic adhesive on plain side. Our adhesive white matt iron sheet allows bonding to a number of surfaces and medias to create a surface receptive to magnets.Once bonded to a surface or media the receptive face can be used in conjunction with a magnetic sheet to create retail graphics or signage. White Matte Self-Adhesive Ferro Sheet - you stick Magnets to it! Magnetic receiptive surface - Perfect Holding! Ferrous sheets and tapes are not magnets; instead they provided a surface that magnets stick to very well. This mat white, self-adhesive, flexible ferrous sheet is not magnetic itself but you can stick magnets to it, ideal for creating an instant surface for sticking magnets too. Turn any surface into a magnetically attractive surface with this self-adhesive ferrous sheet. 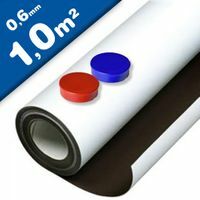 The sheet is matt white on the non-adhesive side and is ideal for making display or notice boards. Use with small but powerful Neodymium magnets to create stunning displays at home, in the office or at school and never have to use fiddly drawing pins again.